Having over indulged over Christmas and well into the new year, my jeans are definitely starting to feel a little too snug! So, I'm now embarking on a bit of health kick going forward into 2017. Nothing too drastic or revolutionary, just balanced, healthy meals to help me shift a few of these extra (almond croissant) pounds, up my energy and keep me feeling fit and well. I've always found in the past that it's easier to stick to a healthy diet if you don't feel too deprived and if you allow yourself a treat now and again, in moderation, over the weekend. So, while my weekdays will be full of fruit, veggies, porridge, avocados, eggs and no sugar - I'm putting a self imposed ban on cake in the week, I'm going to allow myself a tasty, homemade treat at the weekend. 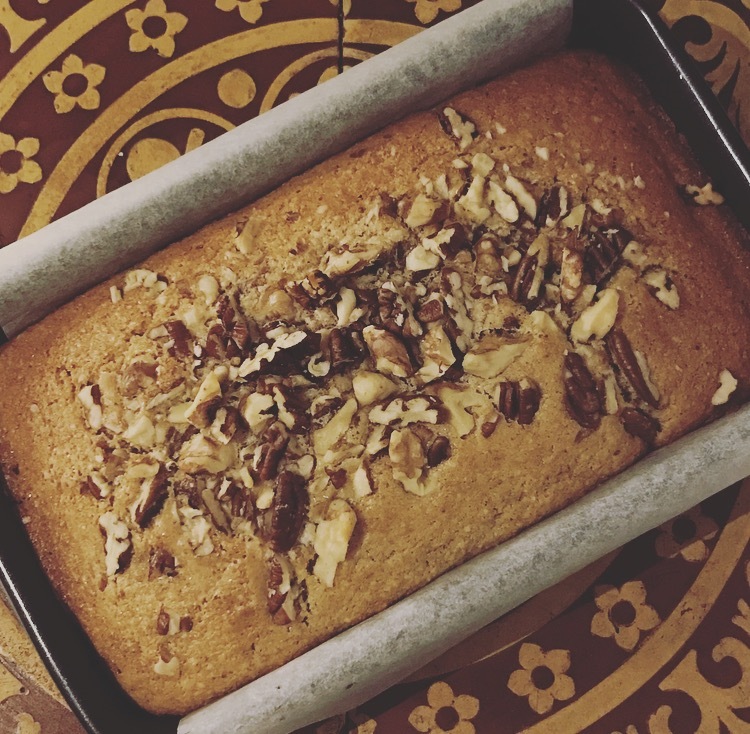 I baked this nutmeg cake on Sunday afternoon and it was so good! Lightly grease a loaf tin and line with grease proof paper. Add 3 eggs, the vanilla, nutmeg & cinnamon. Pour mixture into the loaf tin and chop and sprinkle the nuts over the top. Place in the middle of the oven and bake for 45 - 55 minutes, until golden and cooked throughout. Take out of the oven and drizzle the maple syrup over the top. Leave to cool and serve with a mug of your favourite tea.